Health: Warm Water with Lemon - Something New Everyday! 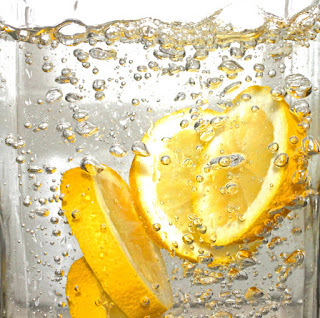 Lemon water is one of my favorite drinks, it not only quenches thirst better than any other drink, but it nourished our bodies so much more than you would ever believe. Unbelievable things happen when you drink it. Upon waking our bodily tissues, are dehydrated and are in need of water to push out toxins and rejuvenate the cells. Lemons are incredible alkaline foods. They may be acidic on their own, but inside the body they are alkaline. Warm water serves to stimulate the gastrointestinal tract and peristalsis, the waves of the muscle contractions within the intestinal walls that keeps things moving. Lemons are high in minerals and vitamins that help to loosen the ama or toxins, in the digestive tract. The vitamin C helps decrease wrinkles and blemishes. Lemon water purges toxins from the blood that helps keep skin clear as well. Lemons are high in vitamin C, which is great for fighting colds. They are high in potassium, which stimulates brain and nerve function. Potassium helps control blood pressure. It is known to have anti-inflammatory effects, and is used as complementary support for asthma and other respiratory symptoms plus it enhances iron absorption in the body; iron plays an important role in immune function. 5. Provides the body with electrolytes that hydrate your body. 6. It is good for the joints, and reducing pain in the joints and muscles. 7. Produces more enzymes from water than food. 8. Help lower blood pressure. 9. Helps to prevent cancer. 10. Aids in weight loss. 11. Helps to dissolve gallstones, kidney stones, pancreatic stones, and calcium deposits. 12. Helps to relieve heartburn. 13. Helps to dilute uric acid, the built up of which leads to pain in the joints. Just like what it does for the skin to be blemish-free and scar-free. It also helps in healing and maintaining healthy bones, tissues and cartilages. Lemons are wonderful for the body, but it is very important to dilute it with water; warm water is one of the components that makes this pair so wonderful for the body. Take Half a cup of warm water and squeeze in at least half a lemon’s worth of juice. It is important to drink it first thing in the morning on an empty stomach, I like to do this the night before and leave the water on my bedside table. This way before my feet even touch the floor I have my water, and I am ready to take on the day.